Perfect for your next crafting session, this Pom Poms Assorted Glitter Pack are great for all projects. With their soft texture, they're perfect for use in nurseries or primary schools and bond easily with most adhesives including basic PVA glue. This pack has been coloured with bright and vibrant tones with a hint of glitter running through â€“ the ideal choice for festive crafts or those extra special pieces. The pom poms come in a variety of different sizes from 7mm through to 38mm and in a range of vibrant colours to suit your needs. 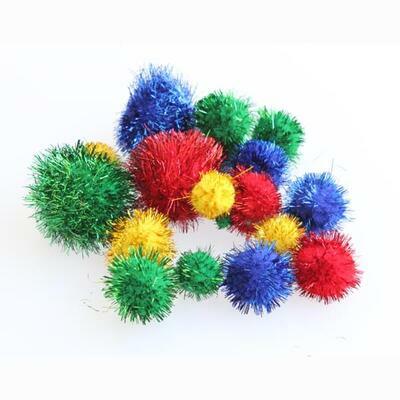 We also have pom poms in an assorted woolly pack of 100 and other craft resources such as buttons and ribbons.